Jacqueline Lou Skaggs has a lot of patience, and quite an eye for detail. 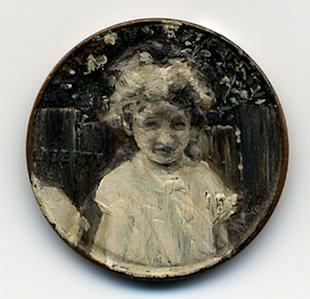 Skaggs, a 48-year-old Queens, N.Y. resident, is the artist responsible for the 12 miniature works of art, each carefully hand-painted on discarded pennies she had found and used as her painting canvas. But Skaggs' penny art collection titled " Tondi observations" is one of kind. She said these paintings were done in the early 1990s, and isn't sure she'd be able to do them now. "I don't know that I could paint them again. I'm not a miniature artist, or generally a painter. I'm a conceptualist. Things are invented however is necessary for the idea," Skaggs told ABC News. "I was just on a mission with those works, and I was so interested in the discourse between the images and the coins. I was compelled to create them." Skaggs often gets asked how long the miniature pieces of art took to create, but she explained there is no simple answer. "I'd work on several at a time. So it's hard to say. Some images went a lot more quickly than others. The portraits took a while. The slightest touch of the brush was too much, or not enough. You could turn an eye or a mouth into a blob of something," Skaggs said. The idea to paint on the pennies came very naturally to Skaggs, but she was concerned the novelty of the pennies would transcend the conceptual ideas she was trying to impose on the coin. "I was an avid penny picker-upper. I never let one go. I loved the idea that these very sentimental, thoughtful images were going to be applied to this discarded coin," said Skaggs. "There are layers of curiosity, philosophical and social, in the discarded coin- let alone the act of picking one up. I knew the novelty would just become another language of seduction. " After Skaggs cleaned the pennies with denatured alcohol to remove any surface dirt, she used a triple zero sized sable brush to achieve the minuscule details of each painting. 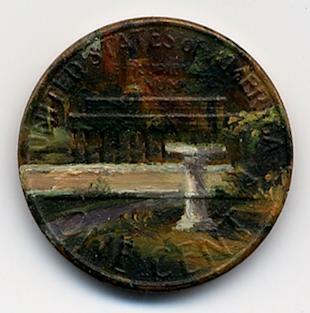 Skaggs also cleverly chose to incorporate the year the penny was manufactured into the title of each artwork, effectively merging the two different identities into one. "I decided the works were conceived when the coin was manufactured, when the coin was pressed. I included the year because to me it really married the concept to the coin," Skaggs explained. "I wasn't just merely using at it as a surface. Without that coin, they would just have been miniature paintings. It was a way to make that sort of a unified idea, the date of each penny." Originally, the artist planned to spend the coins once she had completed the paintings to put them back into circulation. "Initially these coins were going to be spent- nestled with other coins in an exchange of goods. Or tossed back to the sidewalks from whence they came. Nice thoughts," Skaggs wrote on her website's description of the coin collection. However, over time, each piece became too meaningful for Skaggs to part with. "I loved the idea this coin would have this sort of magical treasure attached to it if someone found it. But I just became too fond of them. A lot of the images are very personal, and very meaningful to me. They describe my religious and social perspective. My ego got involved. So I hung on to them," she said. The penny paintings have been featured in galleries across the country, and have even been on display in certain banks, but they're currently with Skaggs in her home in Queens.